Find your Alphabet Toys to buy here. Toys can mean more than just having fun, they can be educational and fun at the same time while offering strong developmental benefits. 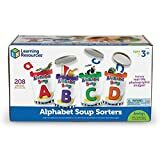 Alphabet toys can help young minds learn and become more familiar with each letter of the alphabet and lay a good essential early skills foundation. Explore our curated collection of Alphabet Toys which we have enjoyed and had recommended to us by like-minded parents. More information can be found by clicking the affiliate links below. 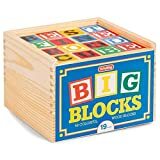 A collection of large wooden blocks includes 48 wooden ABC blocks in make up this fun alphabet toy. Suitable for ages 18 months and over. 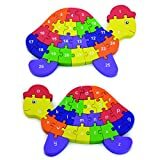 Help children learn the alphabet and numbers with this bright and hands-on turtle shaped wooden jigsaw. Double sided toy with A-Z letters on one side and numbers on the other. This alphabet bath toy collection includes stacking cups printed with a letters A to H and numbers 1 to 8. Complete with a rubber animals to make a fun gift for a baby boy or girl. A big and bright floor puzzle from Orchard Toys. Encourages development of letter skills with the use of interesting objects and characters. This Alphabet Sorter is a fun toy to build early literacy skills. Activity guide included along with uppercase and lowercase letter cards and cardboard soup cans. Matching words, letters and pictures. 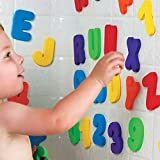 When wet these good sized alphabet pieces and numbers will stick to bathroom tiles, plastic shower screens or similar material. They can easily be removed and repositioned and reused every bath time. Great alphabet toy for ages 3 and up. A fun and brightly painted wooden baby walker what contains alphabet blocks in its lower tray. Helping little ones gain their walking feet and learn the alphabet all in one! 26 pieces of foam tiles interconnect to make a large floor mat. Each tile contains a letter of the alphabet that can be removed and used as a big interactive jigsaw. 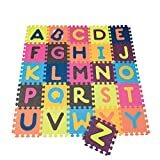 A 52 pieces alphabet toy. Match the upper/lowercase letter pieces to the detailed illustration. A is for Apple, B is for Butterfly etc. Complete with wooden box to contain all the pieces. 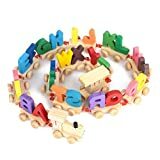 All the pieces of this toy train match up with wooden letters to make a trail of the alphabet from A to Z. 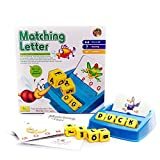 Encouraging letter and phonics recognition this fun word matching and spelling game set is interactive and promotes matching of pictures and words. Aimed at 3 to 9 year-olds children who are already reasonably confident at spelling. 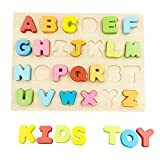 26 wooden toy pieces, one for each letter from the alphabet - match each letter to the right shape on the wooden letter board. A simple yet challenging toy for little fingers. 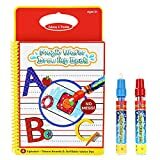 Use the water pens to draw in the alphabet book to reveal the drawings. Four pages of colouring joy for 3 years and up. Let the book dry out and the alphabet drawings with disappear and can be reused. Now this is a toy with everything. From ABCs and lights to fun noises and even songs. The electronic driver panel can be taken off and used independently for younger age ranges and as they grow into the Grow and Go Ride-on clip it together for a bigger experience. 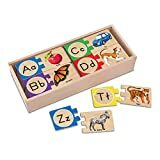 This alphabet toy is a classic and simple painted wooden puzzle for little fingers. 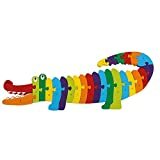 Put the alphabet pieces in the right order and it will form the shape of a colourful crocodile toy. A great fun toy to help learn the alphabet. 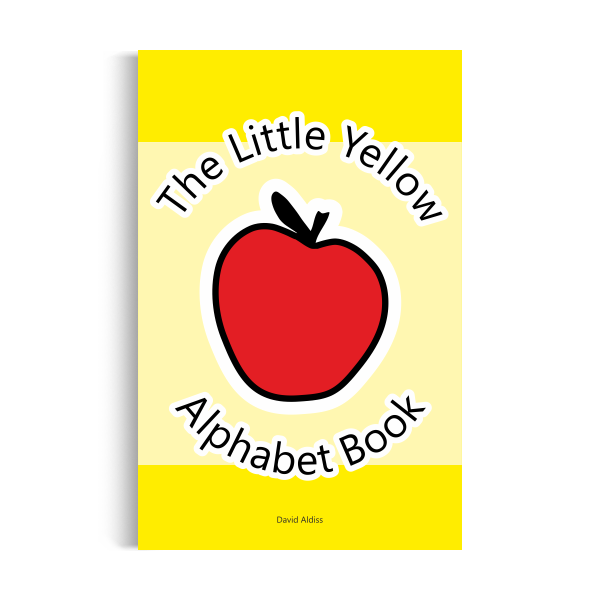 This alphabet toy is in the form of a hands-on book with each page highlighting one letter of the alphabet alongside simple bold illustrations. This is a great fun way to help learn the alphabet any time of the day. A is for Apple, B is for Butterfly, C is for caterpillar... This series is available in Pink, Blue, Yellow and Rainbow editions. What are the different types of Alphabet Toys? Some Alphabet Toys are simple and have stayed the same since adults were young. These include simple wooden cubes to jigsaws and they are some of our favourites. Others are loud with flashing lights that are hyper engaging (remember to check if you need to buy batteries!). There are even some that put the emphasis on integrating with others and in fun game formats. 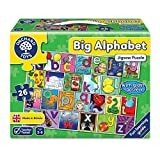 We have included a good range in our list above in the hope you find the perfect alphabet toy you are looking for. Look for alphabet toys that cover the full 26 letters of the alphabet and consider whether you would like to extend this to include phonics. If you are keen to get your little one off to an early start learning the alphabet then alphabet toys make a great way to help you on your way. From our experience there is nothing like learning while having fun and these toys certainly tick all the fun boxes! Some toys are tactile and build detailed motor skills while others build on becoming familiar with each letter of the alphabet. Choosing a selection of different ones can help add a nice variety. What age are alphabet toys best suited to? 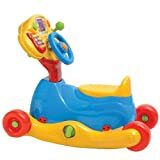 Most of the toys here should be suitable for babies up to children aged 4 years and in some cases more. You can read more information on the details page for each alphabet toy. 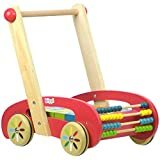 Toddlers can often start young with alphabet toy blocks and alphabet toy play mats and 3 to 4 year-olds are likely to appreciate the battery operated interactive toys with sounds and lights. 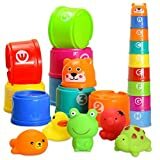 Alphabet toys make a good present idea for a 2 year old, 3 year old and 4 year olds, and any age where alphabet learning is needed. We think an Alphabet Toys are a great way to introduce the alphabet to eager learners.